There’s always a handful of recipes that are good to have in your back pocket: easy weeknight meals that you can return to again and again, a favorite homemade sandwich bread, a good recipe for broth, or homemade mayonnaise that never fails. This recipe? It’s one of them. 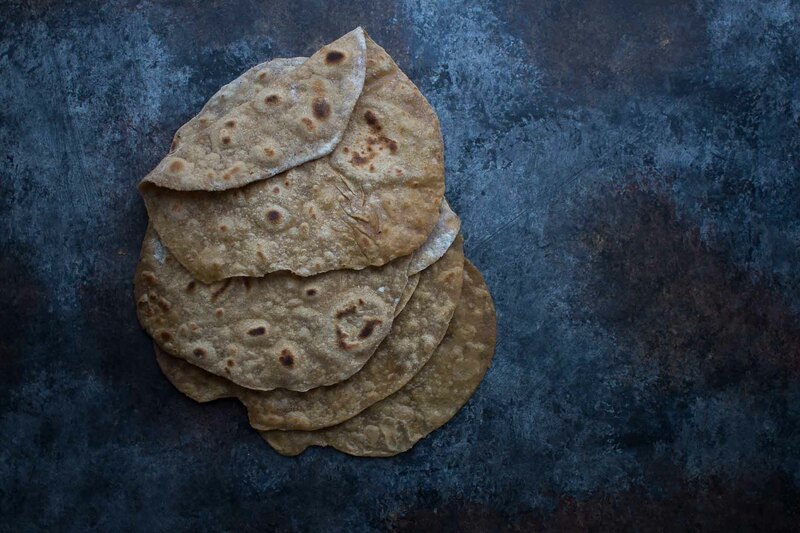 My husband and I had been looking for a good reliable flatbread recipe made with properly prepared grains – something that we could use to wrap up beans and chili-spiced meat when we make burritos, or one that can help us sop up fragrant curries. This is that recipe: It’s easy to make, requires few ingredients, and it’s incredibly versatile. Whole grains are good, but sprouted grains? They’re even better. When grains sprout, they release enzymes within their kernels that begin to transform them from grain to vegetable. It’s this fragile moment of intense enzymatic activity that you capture when you use sprouted grains. Those enzymes help to deactivate components of the grain that can make them difficult to digest and make their minerals difficult to absorb. As a result, sprouted grains and flours made from them are just a little more nutritious and a little easier on your belly, too. When it comes to their culinary use, those same enzymes help to metabolize complex carbohydrates within the grain, which makes the flour ever so slightly sweeter and less bitter than regular whole grain. Even more, sprouting lends a softer crumb that other whole grain flours don’t have which is why I tend to favor sprouted flour when I bake treats like cookies and muffins. These flatbreads are so easy to make: Just mix the dough, roll it out and cook it in a hot pan for a minute or two. You can use them as wraps, in place of tortillas or in place of chapati. This recipe is reprinted in partnership with King Arthur Flour, check out their guide to sprouted wheat flour here. It's filled with tons of tips and inspiration. Next on my list to try is their Vanilla Chai Bars. In a medium bowl, whisk together the flour and salt. Stir in the oil and hot water, adding more water if necessary to make a soft, elastic, slightly sticky dough. Flour your work surface, and then knead the dough until it's smooth, about 1 minute. Divide the dough into 6 pieces and shape them each into a ball. Cover the dough balls and allow them to rest for about 15 minutes. Lightly oil the griddle or pan, and fry one dough circle for about 30 seconds, until lightly browned on the bottom. Flip and fry the second side of the dough, pressing it down gently with a spatula if it starts to puff. Cook for an additional 30 seconds, until golden. Cover the cooked flatbreads with a clean towel while you cook the remaining pieces. Serve warm. You could always sprout your own grains, dry them and grind them into flour, but the process is relatively time-intensive laborious, and the variable conditions of a home kitchen can, likewise, give you variable results. It’s a fun project, but when I don’t have time and want a consistent result, I turn to King Arthur Flour. They’ve developed a patented sprouting process designed to reduce that variability so that you get consistently good results every time you bake with sprouted grains. Check out their guide to baking with sprouted wheat flour here, and order their sprouted flour here. I would want to try using this recipe for a quiche crust…do you think it would work? It seems very close to a quick crust recipe I have used in the past, with EVOO, flour and salt. This recipe makes a great flatbread but I wouldn’t recommend it as a quiche crust. You can use sprouted wheat in a quiche crust – just substitute half of the flour called for in your recipe with sprouted wheat flour. This looks so good! I’m concerned about the glyphosate in non organic wheat. King Arthur’s sprouted wheat is not labeled organic. Do they not spray? Does sprouting remove or change the effect of the pecticide? Do you just use it sparingly? I know you are concerned about this as well. Thanks. May I use Jovial sprouted wheat in this recipe? Jovial Foods sells einkorn flour which performs slightly differently in cooking than does wheat flour, and needs a slightly different hydration. 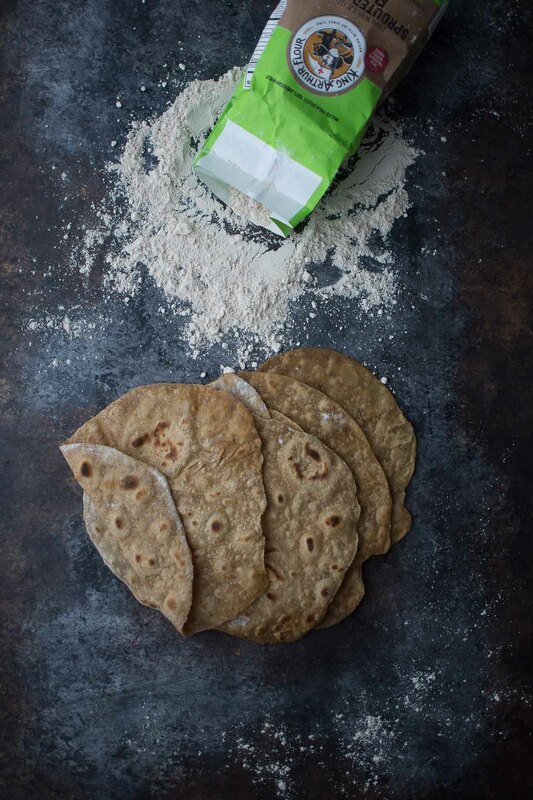 So you can definitely use this recipe as a base for a sprouted einkorn flatbread, but it may need a bit of trial and error to get it quite right. Nutritional info per serving, carb count, fiber count at least ? No. You know how to use the internet. Look it up yourself.